Before trying to find out who was wearing Tony Parker’s uniform on Christmas Day, let’s get busy with this week’s episode of The Starting 5. 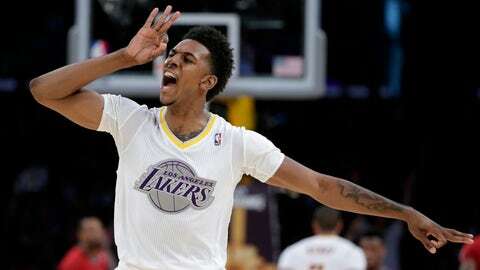 Lakers forward Nick Young shows off the Fruit-of-the-Loom look after sinking a 3-pointer against the Heat. Our most important lesson was the brutal acknowledgement of how sideways expectations can lead to several hours of bad basketball. That’s what we had in New York City. But we also learned that having really big logos on the front of jerseys can’t prevent the entire outfit from looking like Tour de France attire or — when presented in all white — something out of a Fruit of the Loom ad. What the sleeved jerseys did provide was an excuse — restriction of movement — for guys who didn’t shoot well. Anyway, our lesson list also should include something about how being a really smart basketball player doesn’t guarantee coaching success â¦ especially if you start coaching a few weeks after that playing career is over. We also were reminded of James Harden’s ability to succeed using rope-a-dope tactics, and of OKC’s use of player-development dedication to help replace some of his production. Wheel or lottery, that is the question. The wheel is a proposed system of draft-position equality that would, in theory, tank-proof the league. It should be noted that the two New York teams only seem to be tanking. 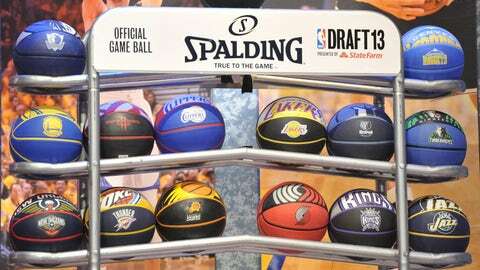 Anyway, the wheel, which would replace the lottery, is designed to provide every team with the NBA Draft’s first overall selection every 30 years. In this predetermined cycle, each team would have a top-six pick every five years and be guaranteed of choosing in the top 12 every four years. It certainly seems fair enough and — as frequent lottery participants have demonstrated — the well-run franchises would continue to dominate the league. But while the wheel makes sense as an engine of even-landscape clearing, it has about as much chance of happening as the NBA adopting MLB’s swell system of draft eligibility. Without the hope of draft salvation in June, the really awful teams would have to find other methods of generating interest. Accountability might be required. Yeah, it would be chaos. The Lakers’ roster short-comings have challenged Mike D’Antoni’s sanity. Well, there should be a low level of tolerance for Mike D’Antoni and the lack of defensive focus seen in most of his teams. Wrong topic? OK, we probably shouldn’t blame him for Dwight Howard leaving the Lakers. What? Oh, the question was referring to D’Antoni’s proclamation that fans discouraged with this current Lakers team should find another team to root for. From our vantage point, D’Antoni was right to suggest that it’s pure foolishness to question the effort level on the island of misfit Lakers. Without Kobe Bryant and a healthy point guard for a few games, anyone expecting anything within miles of Showtime would be nuts. And Mike was speaking a few moments after the undermanned Lakers had been poleaxed in Phoenix by a Suns team that has a lot more talent than the national sharpies believed it had. 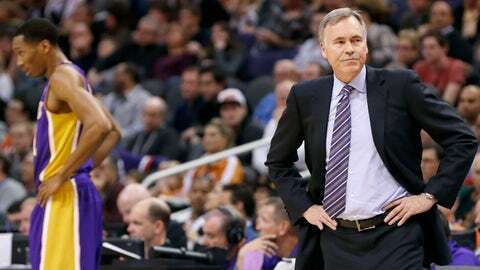 "I was an idiot last night," D’Antoni said. "I was out of my mind." Attempting to generate his offensive system (and guard the Suns’ double-point-guard attack) with Xavier Henry standing in as the playmaker would make any coach a bit loopy. 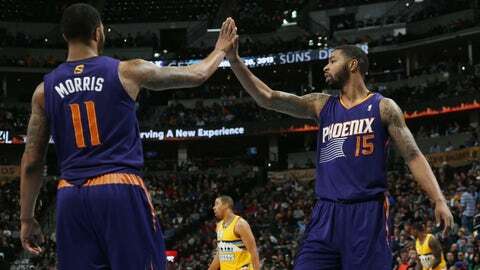 The Morris twins, Markieff and Marcus, are enjoying the Suns’ climb into the upper echelon of the Western Conference. If âfor real’ means the unexpectedly salty Phoenix Suns are going to finish the season with the Western Conference’s fifth seed, we’d have to be a bit skeptical. But that doesn’t mean there’s not a lot to like. The Suns, who have won 8 of 9, were expected to be sort of fun to watch while losing their way into a high lottery pick. Instead, first-year head coach Jeff Hornacek has coaxed them into the upper echelon. Half of the wins in this run up the standings occurred vs. conference foes with winning records. And there were road victories in Houston and Denver. The Suns are fifth in the league at 3-point success rate (38 percent) and have converted 40 percent or more of their attempts from beyond the arc in 5 of the recent wins. But it’s not simply a matter of streaky shooting. Now that Eric Bledsoe and Goran Dragic both are healthy and working together, their ability to collapse defenses has led to more open looks. Take away those open looks and the Suns understand how to exploit the wide-open spaces by going to the rim. Another reason to like Phoenix is its schedule; the Suns still have 25 dates with Eastern Conference teams. While a growing sample size can provide opposing coaches with more ideas on how to deal with the Suns, we should expect them to remain solid contenders for a playoff spot. A curfew is the latest gimmick in Mike Woodson’s efforts to get a rise out of his unresponsive veteran roster in New York. 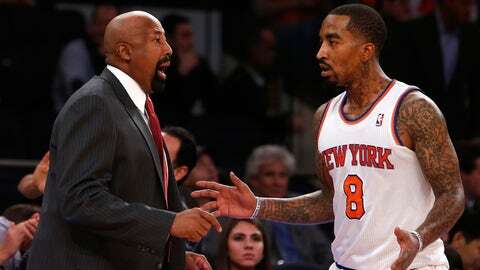 Among the interesting stories erupting from Madison Square Garden was a report that New York Knicks coach Mike Woodson imposed a curfew on his team last weekend. Many observers would argue that it’s already too late for the Knicks. But those experts apparently haven’t noticed the Eastern Conference standings. By the way, along with the curfew, Woodson had the Knicks hunkered down in a hotel on the night before a home game. "I’m not going to let them hang out," he said. Well, if most of the Knicks players stay out late on the night before games, keeping them together and off the streets might seem like a decent move. But if such action is required to keep veteran players focused, does that particular team really have an opportunity to thrive? The Knicks aren’t exactly a team full of kids. If they lack enough professionalism and maturity to prepare properly, gimmicks such as curfew probably won’t do much.